Like most beauty bloggers, I have a lot of makeup (ok, a lot might be under selling it a bit). 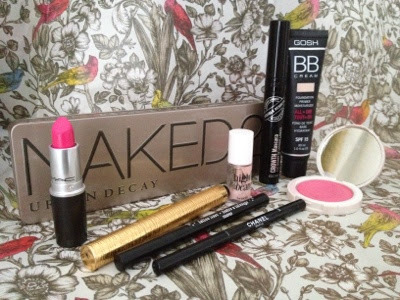 To make the most of all these lovely products, I try to have a switch around in my makeup bag every few weeks. As spring is now firmly on the way, I'm picking a few new products to use alongside some of my favourites, and making an effort to put some more colour into my face. So what am I using right now? I managed to squish quite a lot into this cute little bag! I have a feeling Pink Pigeon will be staying in my makeup bag for many months to come. Damn you MAC for making it a limited edition! Oooh! In love that lipstick, i wear Mac Speed Dial a lot, and I'm liking OCC lip tar in Pretty Boy, but neither are this bright neon pink. When you say ltd. ed. - is it still available now do you know? I've never tried Topshop cosmetics, despite everyone raving, maybe I should give them a go. As for High Beam, I've got it and can't stand it? Have you done a post on it on its own? I reckon I just use it wrong but I can't see the point in it! Cute makeup bag! Pink Pigeon looks gorgeous! Hopefully, they'll re-promote that lipstick in one of their future collections. That mac lipstick is such a gorgeous shade and I love the naked palettes!